Over the past few months I've taken the stance that I won't shill for GW unless the model release is directly transferable to Kings of War - and the models are GW's usual superior sculpts and not "stupid". "Stupid" is a technical term coined by me to describe some of GW"s 2015 offerings e.g. Primarily anything Stormcast (whole range). 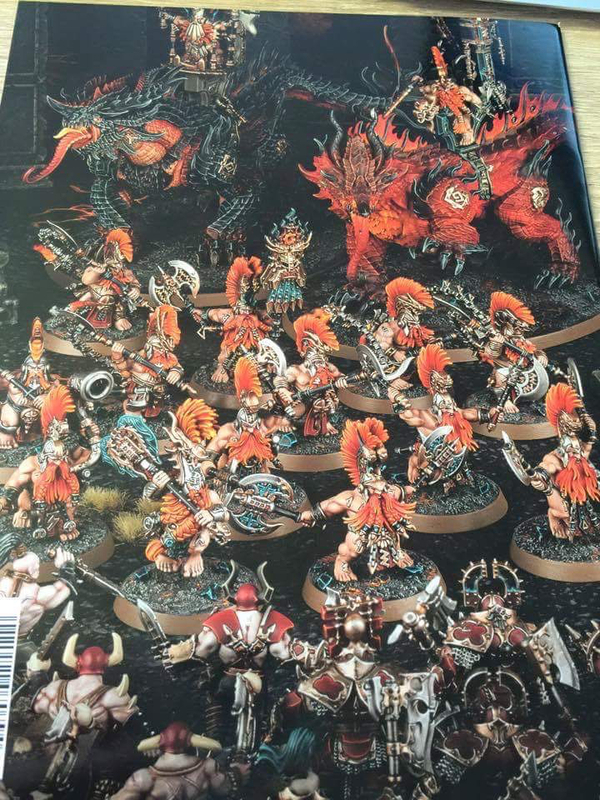 This morning I saw pictures of the new Dwarf Slayer models and they are indeed very pretty. Of course they have a silly trademarkable name - Duodenum Bileslayers or some such nonsense - but the sculpts are great. There are two varieties of box set to buy - apparently one has shorter beards and costs more. In USD terms they are 5/$40 Shortbeards and 10/$60 Longbeards. For us NZers I'm guessing $100 and $150 respectively. I'm not going to comment on the Lavabeasts in the background other than to say that they are ridiculous and fugly to boot. Can't say those slayers tickle my fancy, like so many recent GW releases, they're "more is too much". The simpler slayer models from the 80s and early 90s work better I think. The lavabeasts look like they'd be good for oriental dragons or monsters, like a Samurai KOW army, rather than for any dwarf armies. Again, I won't be getting them, and especially not at the price you just know that GW will charge in NZ dollars. I like the change to helmets rather than just mohawks, and other than the one in the centre with the "I once killed a troll THIS big" stance, the poses are quite dynamic. Regardless, the pricing of of all GW's AoS offerings keeps them well and truly out of consideration for me. Might buy some more stuff from the old range from GW direct if I can't find it in NZ stores, but new stuff? Nope, not even if I absolutely love the sculpt. Dwarves riding ugly dragon things... So much wrong with that. KOW - Warlords' Super Series "SUMMER"